Don’t Use Tax Assessments to Value a Home! FranklyMLS.com now offers in the spreadsheet view a % Difference between the Tax Assessment and the List Price. But I’m here to tell you that I see too many buyers giving TOO MUCH weight to the tax records and tax assessments. (So why offer it? Well cuz you want it anyway). 1) The MLS freezes tax data on the day the home is listed. 1) They don’t show seller subsidy! 2) 30-90- days behind. Sometimes months behind the MLS Sold data (not available publicly). 3) Bank Sales Price is inaccurate. If you see a home that was $500k in 05 and the bank “pays” $300k for it last week, don’t think that that was a real transaction and somehow their break even is really $300k. Otherwise you could have bought it for $301k (which is not the case). My mother used to always do this. Great she saved $25/mo, but now buyers sleuthing the tax records, incorrectly think her home is worth $40k less. 2) Little rhyme or reason. Nobody knows exactly how the computer in the sky picks the tax assessment for a unit. Rarely does it account for upgrades, view, facing Rt 66?, etc. For example 2 units in Clarendon 1021. One is a 600 sqft studio, one is a 600 sqft 1bdr. Both bought for the same price. That extra wall somehow makes the tax assessment 10% higher. 1) Free Sneak Peak on Bank Listings Coming Soon. 2) Verify MLS Data. Is it really a 4 bedroom? Is the agent trying to sneak in another non-legit bedroom? The tax records are a good place to verify this data and square footage data. Too frequently I will get an Excel spreadsheet from a well intentioned buyer, based on the Tax records. Who needs a stinking Realtor anyhow right? Sorry, but it tends to be all wrong. Sure, I’ll take a peek at Virginia Tax Assessments & Records, and see if they reveal anything interesting, but I won’t rely on them too heavily. Regarding ‘stacking the seller subsidy’…. If a buyer has a big enough down payment (say 22%), wouldn’t they not want to stack the seller subsidy? Even if you bought it with 100% cash, I would stack the seller subsidy. For example, Let’s say the buyer and seller accept $400,000 net. I would adjust it to be $410,000 with $10k back. That way it records for $410k in the tax records. So yeah sure, it won’t help with your loan, like those putting 3% of 5% down, but it helps with resale. Email me if you have a specific question. repairs. I hope that’s the case when I buy my first home. What can the seller subsidize for me? You have mentioned in your blog before that realtors have access to the seller subsidy data on a given sale. Wouldn’t a perspective buyer (in the fute) have similar access? This finding would expose the profit. It would expose to future buyers of my house and my neighbors. Are tax assessment heavily influenced by home sales? If so, I should intend to keep my home purchase as small as possible to pay lower property taxes in the future. Even though tax assesment can be off, it would still be helpful those bargain shoppers out there to be able to sort by the “Listing Price / Tax Assesment” column in spreadsheet view. Savvy buyers will be able to look at a bogus number, but a good deal would still make it near the top of the list. Also very curios about pre-MLS listings of the bank owned properties. Where is this data going to come from? Great question. Sorry for skipping over the definition. A seller subsidy is when the seller pays for closing costs. Usually these are around 2%. 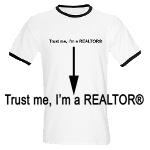 As for Realtors having access to the Seller Subsidy, yes they do. But first of all, the buyer is the one that is frequently doing research (since they think Realtors are worthless) so they will NOT see the net price after subsidy. And my guess would be that only 50% of Realtors see the Subsidy. It depends how they have their searches set up. My search results have the subsidy right next to the close price. The default search burys it. So many lower tech agents might not see it. As for tax assessment tied to closing price, read the link to the blog “Don’t fight your tax assessment.” Yes, you might save $5 a month, but then might lose several thousand. Real estate assessments are appraisals — the County ‘ s opinions of value for each parcel of real property in Arlington . Assessments are made according to accepted methods, techniques, and standards of the real estate appraisal and assessment profession. The 2008 assessment is an estimate of the fair market value as of January 1, 2008. Residential assessments were based primarily on neighborhood sales occurring from July 1, 2006 through June 30, 2007, and further refined using sales occurring in the summer and fall of 2007. The real estate tax rate determines the amount of the tax which is levied on the property. A uniform tax rate for all real property is set by the Arlington County Board. In layman’s terms – real estate professionals bless the valuations that are based on previous year sales of comparable properties. Now you can argue what is comparable or you could simply take a sample of properties from the same neighborhood, compute the tax assed value per square foot (at the time of sale), subtract a theoretical commission for the broker (say 7% – 3.5% to the buyer’s broker and 3.5% to the seller’s broker) and you will find forecasted valuation range. Now since tax assessments are based on trailing sales statistics of comparable properties, in falling markets like ours, keep in mind the tax assessed value will be higher then a forecasted valuation. In newer buildings like 1021 we don’t have the luxury or historical info but Lion’s Park and Lion’s Village have been around since the 1930s so we have lots of historical data to analyze. I do agree that tax assessments are not perfect but they will tell a potential buyer if the seller has based their price on reality or 2005-2006 fiction. I feel dumb. Thanks for telling me about the typo corrections. Anon, while I generally agree with your last post, I will add that assessments often do not include any major upgrades inside a home. Two near identical homes side by side, assessed similarly could be $50k apart in true value. I’m not a buyer but I wanted to say I just found your blog today in a link from this article http://redtape.msnbc.com/2008/07/traditionally-b.html#posts which came up on my igoogle page. I work for a real estate company in South Carolina and I’m adding your blog to my favorites. This is good stuff- especially your rant on the sucky agents who don’t take pictures. Thanks for the fun, informative blog. I look forward to reading. I have lived in Clarendon (Ashton Heights) for about 12 years and have watched my assessment plummet in the past few years. Granted, I have put in over 100k in upgrades during that time, but I did not expect the county or Zillow to notice. All the sudden my home value goes up 35k and land stays the same for taxes. I was thinking of listing this year, should I increase list price because of my tax assessment?